Diagnosed with autism at the age of three, Chase Ferguson experienced difficulty communicating with words, preferring images instead. He began drawing in earnest that same year, depicting fire trucks and ambulances haloed by lines delineating flashing lights. 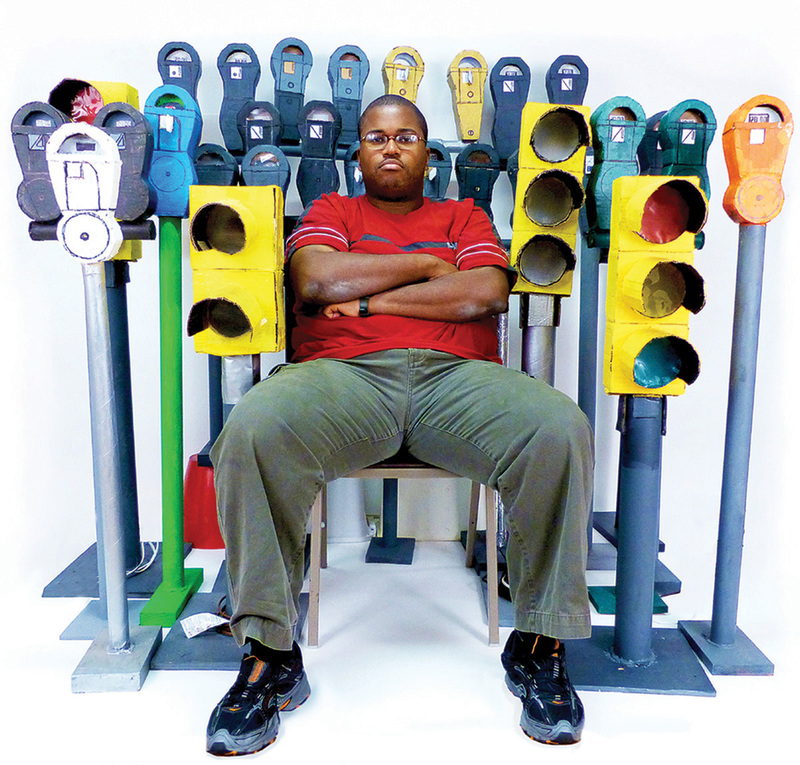 In the process, he developed an obsessive preoccupation with urban transportation systems and infrastructure. Using the most humble of materials, such as paper, tape, paint, cardboard, hot glue, and other mixed media, Ferguson recreates cars, buses, train sets, and parking meters in exacting detail — down to year, make, and model. Drawing his objects first, he cuts them out, folds them over into shape, fixes them with clear tape, then stuffs his folded vehicles, for example, with shredded paper; cut-up straws are repurposed as axils. Cars, Buses, and Trains displays hundreds of these cars, along with train sets and near life-size parking meters, all made with the support and guidance of Pure Vision Arts, a non-profit dedicated to artists with autism and other developmental challenges. These became of interest to Ferguson in 2011, when single-space meters gave way to more technologically advanced models. Often overlooked, these quotidian realities of New York City living became of particular interest. The backbone of our collective city existence, Ferguson gives them pride of place, assigning them special value for their unheralded role in making our lives functional. Pure Vision Arts is an initiative of The Shield Institute.